Strong relationships between families and teachers are critical for successful students, but where do you begin to build them? VideoAmy offers up resources and a playlist of videos about parent engagement. It's all too easy for parents and teachers to be portrayed as being in opposition. Parents can sometimes get involved in ways that aren't productive, and it's unfortunate when beleaguered teachers begin to think of parents as the enemy. But there are wonderful stories out there of educators and families becoming true partners to improve the educational experience for everyone. I've gathered a collection of videos with examples of the many ways schools can build these powerful partnerships. 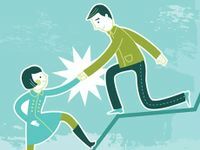 These give actionable tips for both parents and teachers about how best to work together -- a topic which I know is of perpetual interest to everyone involved in education. An excellent case study from NBC's Education Nation on how the Logan Square Neighborhood Association in Chicago provided a bridge between its mostly Spanish-speaking parents and the local schools to build a parent mentoring program. It's not your mother's PTA. There may still be bake sales, but this venerable 115-year-old organization is now five million members strong and continues to make a difference. Learn more about the PTA on their website. The need for parents to take part in their child's education is magnified for English-language learners. The original video is quite long at 12 minutes. In this short segment, Spanish-speaking moms explain to other parents why getting involved with their children's schooling is so critical for success. This hilarious video was made to prep teachers in Kentucky's Henderson County Schools before they embarked on their one-day "Home Visit Blitz" to try to connect with the families of every student in their K-12 district -- that's over 7,000 kids! Learn more from a local news article. This training video from the UK shows new teachers speaking frankly about why parent-teacher communications can be challenging, and offers some thoughts on how to build productive relationships. YES Prep North Central in Houston, Texas, involves families in a variety of ways, including family nights, frequent check-ins, and learning contracts signed by the student and the parents before the kids enter sixth grade. I was tickled to hear fifth and sixth graders speak up about what it means for their parents to be involved in their school. This video is actually geared towards parents, and it's the second half of a longer show; check out part one here. #PTChat moderator Joe Mazza gave this presentation at the #140EDU Twitter conference. In this excerpt, he describes several ways he uses technology tools to network home to school and strengthen communications with families. Now that you've seen the power of a strong working relationship between educators and parents or caregivers, where do you begin, if you want to build or enhance it in your school? There are loads of great resources online with tips for both teachers and families on how to make that connection. Here are just a few of my favorites.